"This is the only way to cook bratwurst in Wisconsin. The brats are incredibly tasty! If you can get fresh bratwurst from a sausage shop, do it... it is worth the extra cost. Serve with brown mustard on substantial hoagie rolls, never on hot dog buns. Mustard is important and must always be stone ground. Add warm sauerkraut and ketchup, if you like. Chow down! Think about those Wisconsin summers! Listen to some polka!" Prick bratwurst with fork to prevent them from exploding as they cook. Place in a large stock pot with the onions, butter, and beer. Place pot over medium heat, and simmer for 15 to 20 minutes. 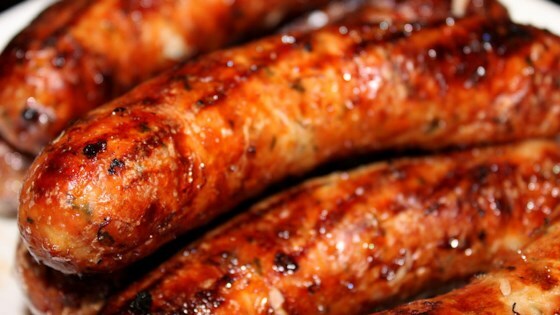 These classic brats are boiled in beer and onions and finished on the grill. this recipe is very good but i found out that if you prick your brats and soak them over night in the beer they are much better.